I’ve been sent the Pure Digital Flip to review, and was looking forward to writing many words about this small toy-like camcorder. Upon receiving it, though, I have a feeling this review might be a shorter than I intended! The Flip, you see, is a camcorder, pure and simple. In fact, simple is the operative word. It’s not only designed to be simple, it’s probably the simplest camcorder on the market today. It’s so simple, even your Granny could use it! All of which has the potential to make this review the shortest one I’ve ever written! 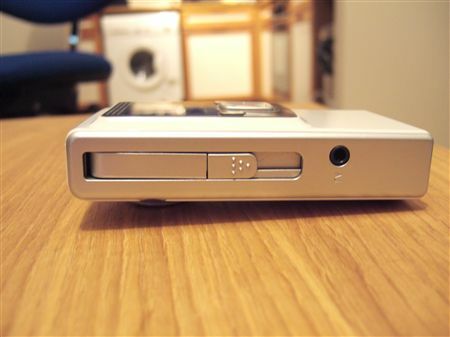 With the Flip, you switch it on, press record, and record some video. Press play and it plays back on its tiny LCD screen. Other than the ability to upload the video to your PC, that’s about it! What else can I write about? OK, there are a few more details. 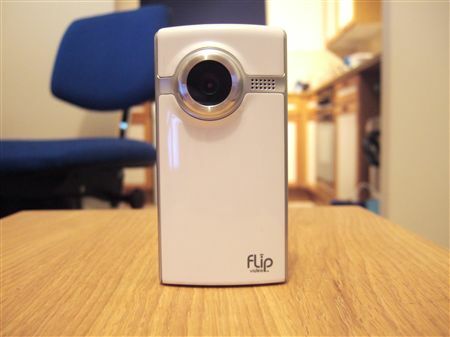 The Pure Flip has been designed to be an incredibly simple point and shoot camcorder, and here it succeeds perfectly. You literally just need to switch it on and press record and you’re instantly recording video. No settings to worry about, no fuss – simple. Playback is just as simple, and although the colour LCD screen is only 1.5″ in size, it’s big enough to get at least some impression of what you’re taking a video of. More impressive, though, is the simplicity of uploading your videos. 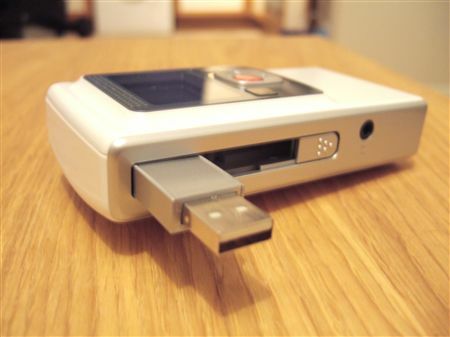 The Flip comes with a built-in USB adaptor that flips out of the side like a pen knife. Plug it into your USB socket, and you can browse all your videos via Windows Explorer. The Flip comes with 2GB of memory on-board, but it isn’t expandable. You can therefore take a maximum of 1 hour’s worth of video before you need to upload what you’ve shot onto your PC. IT also uses standard AA batteries, too, with no power adaptor, so make sure you have a good supply of these if you take the Flip anywhere to record some video (such as a festival). Intriguingly,although the Flip has no features, it does have a standard tripod adaptor, so you can screw it into a tripod if you’re hands are shaking too much. The tripod will cost more than the Flip does, but that’s another story! There are a few downsides though. Although having the USB connector flip out without wires is very convenient, it’s less so if you’re USB ports are in awkward places. Currently my Flip is sticking in my vertical-oriented USB port, where it’s taking up all the room immediately below it. If I had anything else plugged in beneath it, I’d have to remove it before plugging the Flip in. Just a minor point, I know, but it does mean that if you do have awkwardly positioned USB ports, you can’t actually upload your videos onto your PC! The second problem is the quality of the video it takes. There’s a reason why camcorders have tricky to use settings – taking acceptable video in different conditions needs different settings. With no anti-shake or any way of altering the settings, the resultant video quality is poor. Worse, it’s actually less good than on some mobile phones. Which leads me to my final criticism of the Flip: just who exactly is it aimed at? 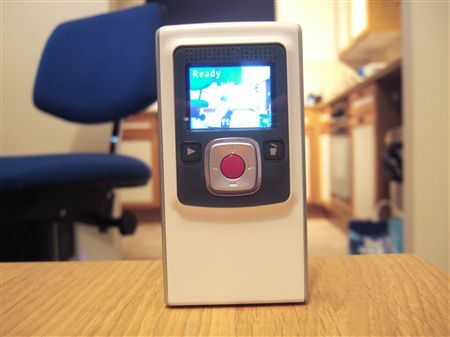 Flip Mino: the next craze in tiny camcorders? Flip UltraHD preview – still the perfect pocket-cam?